StyleFactory PrestaShop theme is a great choice for beauty hair salon, hair care, and online haircut shops. You do not need to have some professional skills to customize this theme. It is highly functional. With the help of PrestaShop premium modules, you will be able to bring your online store to a new level. Using TM Product List Gallery module, you can add an image to each item on the product list, at this moment, show the item from different angles. With TM Mega Menu module it is possible to build a complex menu with custom blocks, products, banners, links, etc. what will allow you to access any category. Coco Chanel said that a woman who cuts her hair is about to change her life. Try live demo right now to see that this stylish theme is what you need to create an effective online hair care shop right now. Implementing this kind of framework tremendously speeds up the entire process of constructing web pages. Standard patterns are easy to transform, which supplies an adaptable and easy method for developing site styles. Responsive design is a technique of web design which enables web pages to adapt to a display resolution of any sort of device - may it be a pc, a tablet or a smartphone. Responsive design might help your internet site look equally perfect on display of any laptop or mobile device. Will TemplateMonster help me to install my Fashion & Beauty PrestaShop ecommerce theme? Some of our products like osCommerce templates, Zen Cart templates, etc. require installation to operate. Installation services are not included in the package price. TemplateMonster though offers you a variety of sources to help you with installation of your Fashion & Beauty PrestaShop ecommerce theme including installation instructions, some articles with our Online Help Center. Our Knowledgebase contains customers questions and most frequent problems. Anyway, you can always refer to our partners from TemplateTuning.com to install your Fashion & Beauty PrestaShop ecommerce theme for you for a small fee. Are your Salon Stuff PrestaShop themescompatible with any CMS? What is a one time usage license for a Beauty Tips PrestaShop theme? When you buy the Beauty Tips PrestaShop theme at usual price you automatically get the one time usage license. It enables you to use each individual product on a single website only, belonging to either you or your client. You have to purchase the same template again if you plan to use the same design in connection with another or other projects. When passing files to your client please delete the template files from your computer. Is it reasonable to make unique purchase of Beauty PrestaShop template that was already purchased before? Yes, it's reasonable to make a unique purchase of Beauty PrestaShop template. Because there is very small chance that you will find the same design on the net. There are more than 3,000,000,000 webpages online now according to statistics on www.google.com. Is it possible that Template Monster will contact my client which website I made from Template Monster's website Hair Salon PrestaShop ecommerce template? Yes, our legal department checks licenses regularly. In case we won't find designer's contact information on the site which was made from the Hair Salon PrestaShop ecommerce template of ours we will contact the owner of the site directly. Will the Beauty PrestaShop design be deleted from TemplateMonster database? No, the Beauty PrestaShop design will not be deleted from TemplateMonster database. I like the image from the PrestaShop ecommerce theme for Fashion & Beauty News and would like to use it for my advertising campaign, can you send me this image in a higher resolution? No, we can't provide image in higher size or resolution rather than it is on the PrestaShop ecommerce theme for Fashion & Beauty News . We recommend looking for professional images on online photo resources. Can I resell PrestaShop designs for Beauty Blog I bought the developers license for? You cannot resell the customized PrestaShop design for Fashion & Beauty Blog as a template, but you may sell it as a project to your client. What are the advantages of purchasing a PrestaShop design for Beauty Advice? The major advantage of purchasing a PrestaShop design for Beauty Advice is price: You get a high quality design for just $20-$70. You don't have to hire a web designer or web design studio. Second advantage is time frame: It usually takes 5-15 days for a good designer to produce a web page of such quality. Can I get the Salon PrestaShop template in higher resolution to use for printing? No, we design Beauty PrestaShop themes optimized for web resolution only. Can I customize the PrestaShop design for Hairdresser? Yes, you can customize the PrestaShop design for Hairdresser to any extent needed. You cannot use a header of the template for one project though, and images from the template for the other project. 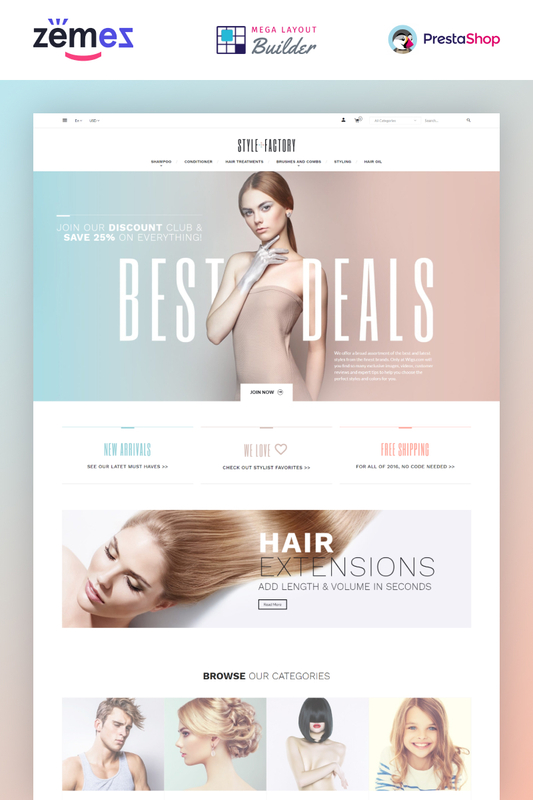 Can I resell the PrestaShop ecommerce theme for Hair Salon for Women as is? No, you cannot resell the PrestaShop ecommerce theme for Hair Salon for Women as is. Make sure that these charges for Beauty Blog PrestaShop template have different order IDs. If it is so, contact our billing department. Will TemplateMonster help me to edit my PrestaShop design theme for Hair Salon Equipment Store? TemplateMonster offers you a variety of sources to help you with your PrestaShop design theme for Hair Salon Equipment Store. Use our comprehensive Online Help Center to get the basic knowledge about your PrestaShop design theme for Hair Salon Equipment Store. Our Knowledgebase contains customers questions and most frequent problems. Anyway, you can always use TemplateMonster 24/7 phone support, try our Ticket System or Live Support Chat to get qualified assistance from our support representatives. In what cases I don't need the extended license for Fashion & Beauty News PrestaShop ecommerce templates? What is Developers License for PrestaShop design theme for Beauty Blog? If you purchase a Developer's license, you are granted a non-exclusive permission to use the PrestaShop design theme for Beauty Blog on up to 5 domains for projects belonging to either you or your client. Are there any discounts if I'm buying over 10, 20, 30 or more PrestaShop design theme for Fashion Beauty? Please email to marketing@templatemonster.com with your inquiries about Fashion PrestaShop designs. What is the price for acquiring the extended license for PrestaShop design theme for Fashion Beauty? There is no set price for acquiring the extended license. The price is based on the PrestaShop design theme for Fashion Beauty's unique price for those templates you would like to use for the integration. The price for purchasing license for a single template is half of the template unique price. Is there any return policy for PrestaShop ecommerce templates for Hair Color Salon? What is a buyout purchase license for Hair Parlor PrestaShop design theme? If you purchase the product at a 'Buyout price' it guarantees that you are the last person to buy this template from us. It means that this Hair Parlor PrestaShop design theme may have been sold before a couple of times (see 'Downloads' number in item's properties) but only you and people who bought the template before you will own it. After this kind of purchase the template is being permanently removed from our sales directory and is never available to other customers again. The buyout purchase license allows you to develop the unlimited number of projects based on this template, but the template should be customized differently for every project. I ordered a PrestaShop template for Hair Salon Equipment Supplier but haven't received the download information. In case of not receiving the download information of a PrestaShop template for Hair Salon Equipment Supplier, please contact our Billing Department via support chat by phone or e-mail.